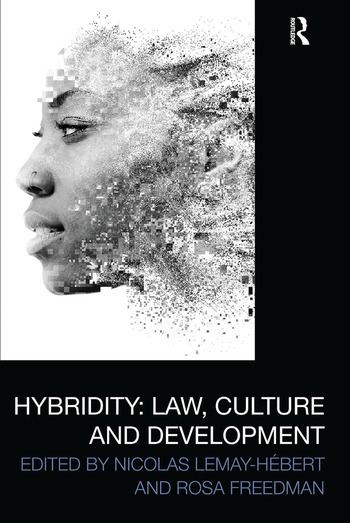 This book explores recent developments in the concept of hybridity through a multi-disciplinary perspective, bringing ideas about legal plurality together with the fields of peace, development and cultural studies. Analysing the concepts of hybridity and hybridization, their history, their application in law and legal studies, and their implications for thinking and rethinking legal plurality, the book shows how the concept of hybridity can contribute to an understanding of the processes that occur when different normative or legal orders or frameworks confront each other. 1. Rosa Freedman and Nicolas Lemay-Hébert: Introduction Part I Localising hybridity 2. Philipp Lottholz: Nothing more than a conceptual lens? Situating hybridity in social inquiry 3. Rosa Freedman and Phillip Lottholz: Peace as a Hybrid Human Right: A new way to realise human rights, or entrenching their systematic failue 4. Fiona de Londras: (Counter-) Terrorism and hybridity 5. Ruth Alice Houghton: Hybrid Processes for Hybrid Outcomes: NGO Participation at the United Nations Human Rights Council Part II Hybridity in history and culture 6. Gareth Sears: From Romanised subject to sophisticated code-switcher: the formation of thought on hybridity and the spread of Roman culture 7. Philip Myers: Hybridity and the Ancient Western Mediterranean 8. Eric Heinze: Legal Hybridity in Shakespeare: Revisiting the Post-Colonial in The Tempest and Cymbeline 9. Mark Kirkman: Hybridity and the Ottoman: What Can We Learn From the Ottoman Statebuilding Framework? Part II New developments in hybridity and legal pluralism 10. Louisa Riches: Legal and Normative Pluralism, Hybridity and Human Rights: the Universal Periodic Review 11. Jon Yorke: Deconstructing a Sovereign Right: The Hybridization of the Anti-Death Penalty Discourse in Europe 12. Ben Warwick: Describing a Rights Realisation Hybrid: The Example of Socio-Economic Rights 13. Kim Barker and Christina Baghdady: From Hybrid to Cybrid? The Formation and Regulation of Online ‘Hybrid’ Identities Part III Hybrid approaches to peace and justice 14. Danielle Beswick: Hybrid approaches to peace and justice: The case of post-genocide Rwanda 15. Paul Jackson: Hybridity or coexistence? The politics of legal pluralism in the West African countryside 16. Sam Fowles: Hybridity as a tool for deconstruction: The case of "Child witches" 17. George Wilson: The View from law and new governance: A critical appraisal of hybridity in peace and development studies 18. Gëzim Visoka: After Hybridity? Nicolas Lemay-Hébert is based in the International Development Department, University of Birmingham, UK, and Rosa Freedman in the Law Department, at the University of Reading, UK.